St. Ignatius of Loyola, pray for your sons! Romæ natális sancti Ignátii, Presbyteri et Confessóris, qui Fundátor éxstitit Societátis Iesu, atque vir fuit sanctitáte et miráculis clarus, ac religiónis cathólicæ ubíque dilatándæ studiosíssimus; quem Pius Undécimus, Póntifex Máximus, cæléstem ómnium Exercitiórum spirituálium Patrónum constítuit. "At Rome, the birthday of St. Ignatius, priest and confessor, founder of the Society of Jesus, renowned for sanctity and miracles, and most zealous for propagating the Catholic religion in all parts of the world. Pope Pius XI declared him to be the heavenly patron of all spiritual retreats." May we also learn to imitate your piety and zeal, O holy Ignatius, and may your prayers bring the Church a renewed faithfulness to the Catholic faith and to the propagation of that faith among all peoples -- and please pray for your sons, the Society of Jesus, that they all will recover your charism. The Archbishop of Sydney, His Eminence Cardinal Pell, celebrated Pontifical Vespers on the Feast of our Lady of Mount Carmel, 16th July in S' Augustine's church, Balmain (Archdiocese of Sydney). The Vespers was one of the Juventutem celebrations leading up to World Youth Day. EWTN filmed the ceremony, and will be broadcasting it on Thursday night and Friday morning US time in their Life on the Rock segment. Several hundred pilgrims attended Vespers, with more than 20 priests and the Bishop of Lismore (Most Rev'd Geoffrey Jarrett) and the Bishop-emeritus of Christchurch (Most Rev'd Basil Meeking) in attendance. Here are some photographs of the event, taken by Dr Chris Steward and Tom Kwok. This [understanding of Tradition] is clearly highlighted and visible in certain passages of the Pauline Letters: "I delivered to you... what I also received" (I Cor 15: 3). And this is important. St Paul, it is well-known, originally called by Christ with a personal vocation, was a real Apostle, yet for him too, fidelity to what he received was fundamentally important. He did not want "to invent" a new, so-to-speak, "Pauline" Christianity. Therefore, he insisted, "I have passed on to you what I too received". He passed on the initial gift that comes from the Lord and the truth that saves. Then, towards the end of his life, he wrote to Timothy: "Guard this rich trust [deposit] with the help of the Holy Spirit that dwells within us (II Tm 1: 14). 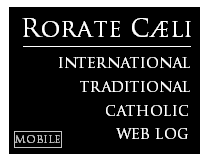 Reposted for the Eleventh Sunday after Pentecost, 2008 (clearly Rorate's favorite Epistle). Recess for a few days; urgent news may be posted at any time. It is my great pleasure to be able to attach a copy of a letter I received this morning (25 July 2008) from Cardinal Levada, Prefect of the Congregation for the Doctrine of the Faith, via the Apostolic Nuncio in Australia. It is a letter of warmth and encouragement. I have responded, expressing my gratitude on behalf of "my brother bishops", reaffirming our determination to achieve the unity for which Jesus prayed with such intensity at the Last Supper, no matter what the personal cost this might mean in our discipleship. 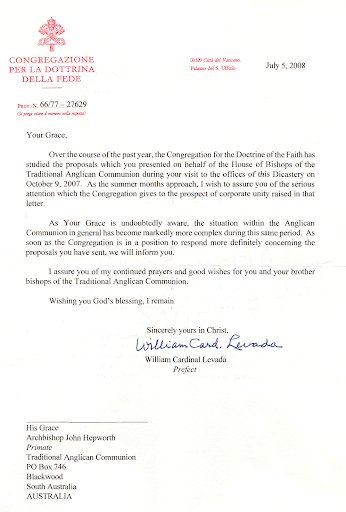 This letter should encourage our entire Communion, and those friends who have been assisting us. 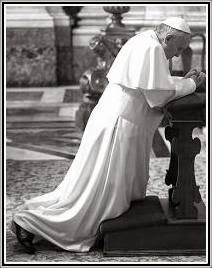 It should also spur us to renewed prayer for the Holy Father, for Cardinal Levada and his staff at the Congregation for the Doctrine of the Faith, and for all our clergy and people as we move to ever closer communion in Christ with the Holy See. I am particularly thankful to the Cardinal Prefect for his generous mention of "corporate reunion", a pathway seldom travelled in the past, but essential for bringing about the plea of our Master to His Father "May they be completely one"’. Wonderful news, and congratulations to the Bishop of Albenga-Imperia, who has welcomed these monks with so much love! What is the origin of this foundation? We can report that Dom Jehan decided to leave Le Barroux because he is firmly attached to the initial charism of the late Dom Gérard Calvet - that is, the exclusive celebration of the Extraordinary Form of the Roman Rite. "The Pope invites us strongly: 'The two Forms of the usage of the Roman Rite can be mutually enriching'. ... In order that the peace may be profound, it is necessary that each one of them takes, without second thoughts, one step towards the other." 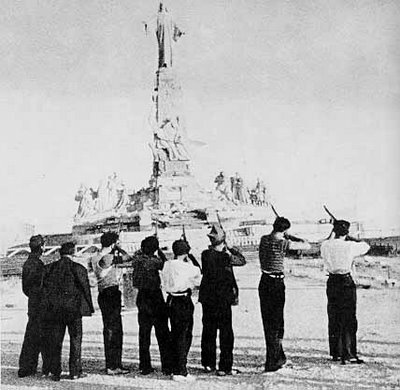 In 1936, during the great Socialist Terror of the early months of the Civil War, the large monument to the Sacred Heart of Jesus in the Cerro de los Ángeles, near Madrid, was attacked and demolished, a symbol of one of the harshest large-scale persecutions of the Church in History. From one of the stones of the demolished statue, a small sculpture of the Sacred Heart was crafted and placed in the public garden outside the Parish Church of San Antonio de la Florida, in Madrid - otherwise a very famous building due to the extensive paintings of Francisco Goya in its cupola. Last Monday (or on early Tuesday), the small statue of the Sacred Heart was torn down and beheaded. One new step in the battle of the forces of secularism (and its vandals) against the Church in Spain, a sign of things to come. The spiritual combat, described in the Books of Genesis and Revelation, has continued unabated all down the ages. St Paul described it in very vivid terms: “We are not contending against flesh and blood, but against principalities and powers, against the world rulers of this present darkness, against the spiritual hosts of wickedness in the heavenly places” (Eph 6:12). This combat rages fiercely even today, aided and abetted by well-known secret sects, Satanic groups and New Age movements, to mention but a few, and reveals many ugly heads of the hideous anti-God monster: among them are notoriously secularism, which seeks to build a Godless society; spiritual indifference, which is insensitive to transcendental values; and relativism, which is contrary to the permanent tenets of the Gospel. All of these seek to efface any reference to God or to things supernatural, and to supplant it with mundane values and behaviour patterns which purposely ignore the transcendental and the divine. Far from satisfying the deep yearnings of the human heart, they foster a culture of death, be it physical or moral, spiritual or psychological. Examples of this culture are abortions (or the slaughter of innocent unborn children), divorces (which kill sacred marriage bonds blessed by God), materialism and moral aberrations (which suffocate the joy of living and lead often to profound psychic depression), economic, social and political injustices (which crush human rights), violence, suicides, murders, and the like, all of which abound today and militate against the mind of Christ, who came that “all may have life, and have it in abundance” (Jn 10:10). Two vital institutions of the human society are particularly vulnerable to such a culture of death: the family and the youth. These must, therefore, receive the special attention, guidance and support of those whom the Holy Spirit has placed as shepherds of the flock entrusted to their pastoral care. No leaving the Church of England? While some Catholic commentators continue to await the hoped-for deluge of Anglo-Catholic conversions in the wake of the Church of England's vote to consecrate women bishops, Forward in Faith, perhaps the largest Anglo-Catholic group in England has announced its intention to continue seeking separate dioceses for those opposed to the ordination of women. These dioceses will, of course, remain part of the Church of England. The Council of Forward in Faith, meeting at Canterbury on 21st July, was appalled at the outcome of the recent General Synod debate of 7th July. The Council remains determined to respond to the needs of its members by securing a structural solution comprising discrete dioceses for those in conscience opposed to the ordination of women as bishops. On Saturday morning, 19th July, His Holiness Pope Benedict was received at Saint Mary's Minor Basilica Sydney and celebrated Mass for Seminarians and young Religious from around the world. This Mass was also the occasion for the dedication of a new marble free-standing altar, the creation of sculptor Nigel Boonham. The most prominent feature of this altar is a depiction of Christ lying dead in the tomb. The choice by Cardinal Pell of such a representation of Christ has not been without criticism. Two years of restoration works preceded the arrival of the Pope to the Sydney Cathedral, but the predominant internal works were the provision of new timber furnishings and screens in the chancel and a splendid new floor of terracotta-coloured stone over the nave, transepts and ambulatories of the Cathedral. The Mass itself was a most glorious celebration, easily surpassing other Masses celebrated by His Holiness outside the City of Rome. Music was provided by Saint Mary's Cathedral choir and a schola of seminarians. The Gregorian Propers of the Mass, together with the psalms for the dedication of an altar were rendered beautifully. Simply splendid and inspiring were the other hymns (Australian compositions from the early 1960's), polyphonic anthems and parts of the Ordinary. It was hard not to draw the conclusion that this was the Cathedral choir's finest hour. Most moving, however, was the gusto with which the entire congregation sang Credo III, the Pater Noster and the Te Deum, all in Latin to the Gregorian settings. Apologies to readers for the lack of coverage of Juventutem and WYD events thus far. Everyone has been so involved with the ceremonies and celebrations that finding time to prepare posts has been impossible. But now, with everything over, we are able to present a series of pictorial reports for readers. They are not in chronological order. Our first presentation is of the Pontifical Mass at the faldstool celebrated by +Monsignor Basil Meeking (Emeritus Bishop of Christchurch). This was a Votive Mass of the Holy Cross, celebrated on the morning of Friday, 18th July. Monsignor Meeking also presented a Catechesis to Juventutem pilgrims before the Mass. The venue was Saint Augustine's church, Balmain. We would like to gratefully acknowledge the warm and generous hospitality extended to Juventutem pilgrims by the pastor and parishioners of Saint Augustine, Balmain. These are pictures of the Traditional Latin Mass last July 6, 2008 at the St. Jerome Emiliani and St. Susanna Parish in the Alabang Town Center of Muntinlupa City (Metro Manila, Philippines). It is a parish of the Diocese of Paranaque, entrusted to the Somascan Fathers. The regular celebrant of the TLM is Fr. Grato Germanetto, an Italian Somascan priest. The choir is composed of veteran members of the old Manila Cathedral Choir. Many had sung in the cathedral in the 1960's. The TLM in St. Jerome has given them a new home where their repertory of Latin hymns and polyphonic Masses can be appreciated anew. I would like to thank my friend and fellow-blogger, Gerald Cenir, for taking these photographs. The inauguration of the TLM in this parish last June 29 was covered by my friend, Fr. Abraham Arganiosa, in his blog here, here and here. We have a long way to go before perfecting this Mass. Furthermore, we are still completing the vestments and the ornaments for the altar. In the Philippines, the priests and servers (and some of the chanters) of the Traditional Latin Mass celebrated in parish churches are basically self-taught, not having had the benefit of training from the FSSP or other traditional religious orders, (although a couple of ex-SSPX seminarians have been of tremendous assistance) and relying almost entirely on videos and books of rubrics. Old priests tend to have forgotten the rubrics and cannot rely on their memory alone, and in any case, liturgical practice in the Philippines prior to 1965 was far from perfect. At present there is a Filipino FSSP seminarian on vacation who assists at Sunday Mass, and we hope to greatly benefit from his advice and instruction. St. Jerome Emiliani and St. Susanna parish in Alabang Town Center, Muntinlupa City (Diocese of Paranaque, in the southern part of Metro Manila) is one of the three parish churches in Metropolitan Manila where Mass is offered every Sunday according to the Missal of 1962. The Sunday Traditional Latin Mass in each of these three parishes is nearly always a Sung Mass. Furthermore, these Masses are spread throughout the day. The TLM in SS. Jerome and Susanna is offered at 9:30 AM, the TLM in the Parish of the Lord of Divine Mercy (Quezon City, Diocese of Cubao, northern Metro Manila) at 1:30 PM, and the TLM in the National Shrine of Our Lady of Fatima (Valenzuela City, Diocese of Malolos, at the north-western edge of Metro Manila) is scheduled at 8:00 PM.